Expert says one photo was doctored, and both US and Afghanistan claimed wrong meeting location. Tactical Talk – Rex Tillerson’s visit to Afghanistan Monday was cloaked in mystery in more ways than one. 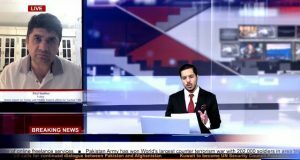 Following the secretary of state’s surprise meeting with Afghan President Ashraf Ghani—which was only reported after the fact—the US Embassy released a photo of the two men seated together in a room with large TV screens, a clock, and a fire alarm visible behind them, giving the location as the capital of Kabul. 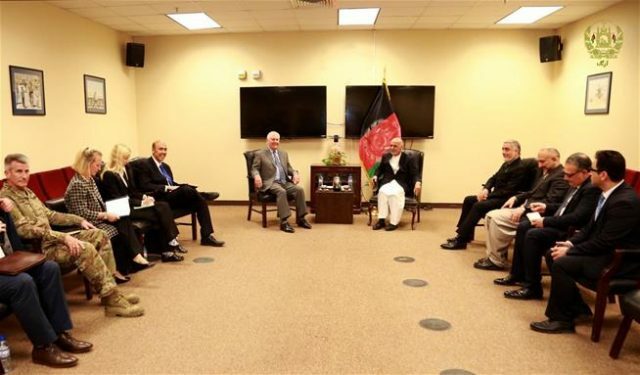 Ghani’s office likewise said the pair had met in Kabul. But in the photo released, the clock and fire alarm had vanished from the wall. As the New York Times reports, the red fire alarm and military-style clock indicated the meeting took place not in Kabul but at the US military base in Bagram, more than 30 miles away. The apparent alteration of the photo—which a photo expert says still showed a cable that would’ve powered the clock and fire alarm—might have been an attempt to conceal the meeting’s location, or to “project strength and advance a positive narrative about the country’s security,” notes Fox News. Either way, the US didn’t mimic the move, though it did issue a total news blackout to conceal Tillerson’s trip from Qatar to Afghanistan until after his safe return. Following the visit, Tillerson called on “moderate voices among the Taliban, voices that do not want to continue to fight forever,” to “engage in a reconciliation process” that could end in their involvement in government, if they abandon terrorism, reports the Washington Post.